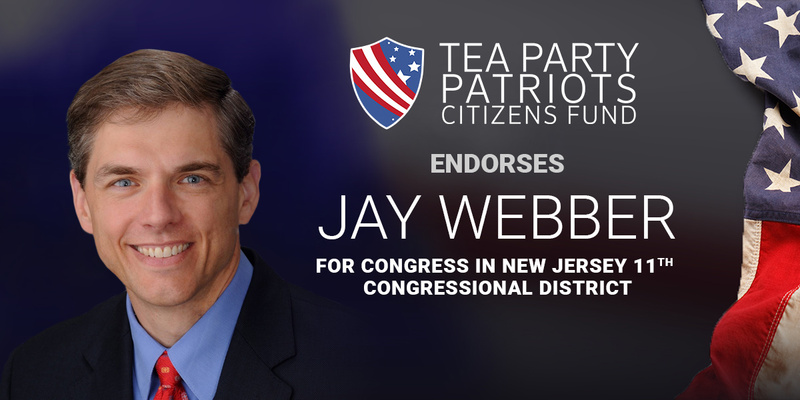 ATLANTA, Ga. – Tea Party Patriots Citizens Fund (TPPCF) Chairman Jenny Beth Martin today released the following statement, announcing that the Super PAC associated with the nation’s largest Tea Party group has endorsed Jay Webber for Congress in New Jersey’s 11th congressional district. “In New Jersey’s 11th congressional district, the choice for conservatives is clear – Jay Webber for Congress. “Jay has been a conservative leader since before he was elected to the state Assembly in 2007. “In the aftermath of President Reagan’s death in 2004, Jay founded and to this day still runs New Jersey Reagan Day, an annual gathering that brings together conservative leaders and activists from across the Garden State. “In the legislature, he has fought liberal attempts to raise taxes and increase spending, and has worked to promote personal freedom, economic freedom, and a debt-free future. He introduced legislation imposing term limits on members of the state legislature. And he had the courage to stand up to his own party leaders when he thought they were on the wrong track – witness his votes against every Christie budget after the first. “As a member of Congress, Jay will support term limits, a Balanced Budget Amendment, and an amendment to set spending limits. He wants to repeal ObamaCare, and opposes Congress’ illegal special exemption from ObamaCare.